As customers bet more and more on Cloud to drive digital transformation within their organizations, we’re seeing tremendous usage of Azure. Recently, Forbes reported a study done by Cowen and Company Equity Research, and stated that Microsoft Azure is the most used Public Cloud as well as most likely to be renewed or purchased. More than 90 percent of the Fortune 500 use Microsoft’s cloud services today. Large enterprises such as Shell, GEICO, CarMax and MetLife, as well as smaller companies like Medpoint Digital and TreasuryXpress are all leveraging Azure to fuel business growth and reinvent themselves. We strongly believe that the momentum we’re seeing has been possible because of what Azure offers and stands for – a comprehensive and secure Cloud platform across IaaS and PaaS, unparalleled integration with Office 365, unique hybrid experience with Azure Stack, first-class support for Linux and open-source tooling, and a robust partner ecosystem. 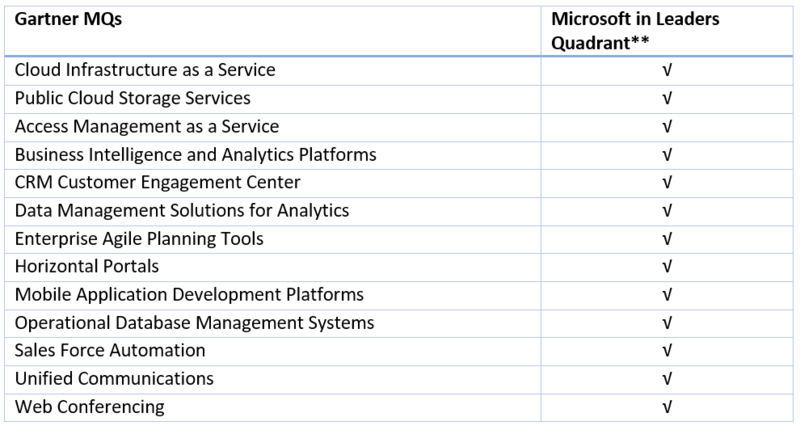 Today we’re delighted that Gartner has recognized Microsoft as a leader in their Cloud Infrastructure as a Service (IaaS) MQ for the fourth consecutive year. We’re excited that Gartner continues to recognize Microsoft for completeness of our vision and ability to execute in this key area. 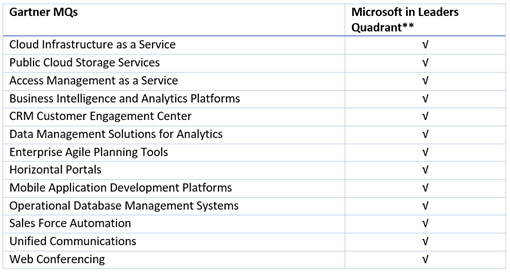 While we’re honored by our placement in the leaders quadrant for Cloud IaaS, we believe many of our customers choose Microsoft not just for our leadership in this area but because of our leadership across a broad portfolio of cloud offerings spanning Software as a Service (SaaS) offerings like Office 365, CRM Online and Power BI in addition to Azure Platform Services (PaaS). It’s the comprehensiveness of our cloud portfolio that gives customers the confidence that that no matter where they’re in their cloud adoption journey, they’re covered with a breadth of solutions for their problems instead of having to work with multiple vendors. We look forward to continuously innovating and delivering across our portfolio of cloud offerings, and sincerely believe that every customer – whether big or small, new or seasoned to the Cloud, relying on open-source or otherwise – has meaningful business value to gain from Azure. If you haven’t dug into Azure yet, here’s an easy way to do it! If you’d like to read the full report, “Gartner: Magic Quadrant for Cloud Infrastructure as a Service,” you can request it here.